Today we had a free day in Kisoro while the last 6 people on our tour visit the Gorillas (there weren't enough permits for everyone yesterday so another change to our itinerary and we skip the extra day at Lake Bunyoni). I cannot explain just how fabulous it was to have a lie-in and not have to drive anywhere today! Spent most of the day wandering the small town, after doing some much needed clothes-washing! Bought, wrote and posted a postcard to the Folks with a cool gorilla picture on the front :) And got myself one or two items. Ended up spending half an hour online google talking to Varen and The Peeb. Was fabulous to have an almost normal conversation instead of sending smses back and forth. Was quite necessary after yesterday's jaunt into the DRC with no cell phone contact - Varen wasn't too impressed with me and this did wonders to smooth things out between us. Also, we had some children from a local orphanage (children who have lost their parents in the Genocide in Uganda & Rwanda) come over before dinner to dance for us. Was very entertaining because of their enthusiasm and we got to chat with them afterwards. 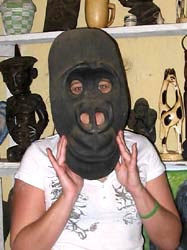 This was especially nice for me because I got to meet the boy who'd carved my Gorilla Mask (bought the one in the picture).